A deadweight loss, also known as excess burden or allocative inefficiency, is a loss of economic efficiency that can occur when the free market equilibrium for a good or a service is not achieved. That can be caused by monopoly pricing in the case of artificial scarcity, an externality, a tax or subsidy, or a binding price ceiling or price floor such as a minimum wage. If market conditions are perfect competition, producers would charge a price of $0.10, and every customer whose marginal benefit exceeds $0.10 would buy a nail. A monopoly producer of this product would typically charge whatever price will yield the greatest profit for themselves, regardless of lost efficiency for the economy as a whole. In this example, the monopoly producer charges $0.60 per nail, thus excluding every customer from the market with a marginal benefit less than $0.60. The deadweight loss due to monopoly pricing would then be the economic benefit foregone by customer with a marginal benefit of between $0.10 and $0.60 per nail. The monopolist has "priced them out of the market", even though their benefit exceeds the "true" cost per nail. Conversely, deadweight loss can also arise from consumers buying more of a product than they otherwise would based on their marginal benefit and the cost of production. For example, if in the same nail market the government provided a $0.03 subsidy for every nail produced, the subsidy would reduce the market price of each nail to $0.07, even though production actually still costs $0.10 per nail. Consumers with a marginal benefit of between $0.07 and $0.10 per nail would then buy nails, even though their benefit is less than the real production cost of $0.10. The difference between the cost of production and the purchase price then creates the "deadweight loss" to society. A tax has the opposite effect of a subsidy. Whereas a subsidy entices consumers to buy a product that would otherwise be too expensive for them in light of their marginal benefit (price is lowered to artificially increase demand), a tax disuades consumers from a purchase (price is increased to artificially lower demand). This excess burden of taxation represents the lost utility for the consumer. A common example of this is the so-called sin tax, a tax levied against goods deemed harmful to society and individuals. For example, "sin taxes" levied against alcohol and tobacco are intended to artificially lower demand for these goods; some would-be users are priced out of the market, i.e. total smoking and drinking are reduced. 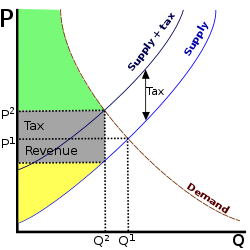 The deadweight loss is the area of the triangle bounded by the right edge of the grey tax income box, the original supply curve, and the demand curve. It is called Harberger's triangle. Harberger's triangle, generally attributed to Arnold Harberger, shows the deadweight loss (as measured on a supply and demand graph) associated with government intervention in a perfect market. Mechanisms for this intervention include price floors, caps, taxes, tariffs, or quotas. It also refers to the deadweight loss created by a government's failure to intervene in a market with externalities. When a tax is levied on buyers, the demand curve shifts downward in accordance with the size of the tax. Similarly, when tax is levied on sellers, the supply curve shifts upward by the size of tax. When the tax is imposed, the price paid by buyers increases, and the price received by seller decreases. Therefore, buyers and sellers share the burden of the tax, regardless of how it is imposed. Since a tax places a "wedge" between the price buyers pay and the price sellers get, the quantity sold is reduced below the level that it would be without tax. To put it another way, a tax on good causes the size of market for that good to decrease. However, if the government were to decide to imposed $50 a tax upon the providers of cleaning services, their trade would no longer benefit them. Amie would not willing to pay any price above $120, and Will would no longer receive a payment that exceeds his opportunity cost. As a result, not only do Amie and Will both give up the deal, but Amie has to live in a dirtier house, and Will does not receive his desired income. They have thus lost amount of the surplus that they would have received from their deal, and at the same time, this made each of them worse off to the tune of $40 in value. The varying deadweight loss from a tax also affect the government’s total tax revenue. 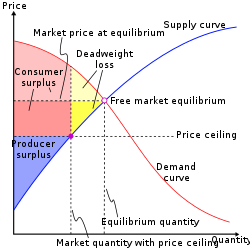 Tax revenue is represented by the area of the rectangle between the supply and demand curves. When a low tax is levied, tax revenue is relatively small. As the size of the tax increases, tax revenue expands. However, when a much higher tax is levied, tax revenue eventually decreases. The higher tax reduces the total size of the market; Although taxes are taking a larger slice of the "pie," the total size of the pie is reduced. Just as in the nail example above, beyond a certain point, the market for a good will eventually decrease to zero. A deadweight loss occurs with monopolies in the same way that a tax causes deadweight loss. When a monopoly, as a "tax collector," charges a price in order to consolidate its power above marginal cost, it drives a "wedge" between the costs born by the consumer and supplier. Imposing this effective tax distorts the market outcome, and the wedge causes a decrease in the quantity sold, below the social optimum. It is important to remember the difference between the two cases: whereas the government receives the revenue from a genuine tax, monopoly profits are collected by a private firm. ^ "Negative Externality". Retrieved February 11, 2012. Case, Karl E.; Fair, Ray C. (1999). Principles of Economics (5th ed.). Prentice-Hall. ISBN 978-0-13-961905-2. Hines, James R., Jr. (1999). "Three Sides of Harberger Triangles". Journal of Economic Perspectives. 13 (2): 167–188. doi:10.1257/jep.13.2.167. .
Lind, H.; Granqvist, R. (2010). "A Note on the Concept of Excess Burden". Economic Analysis and Policy. 40 (1): 63–73. doi:10.1016/S0313-5926(10)50004-3. Worthwhile Canadian Initiative "Too much stuff: the deadweight loss from overconsumption"